In the 1990’s, the Suzuki Swift GTi was king. 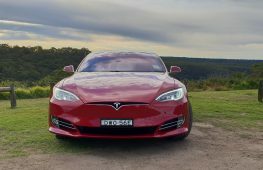 Here was a little tearaway with a 74kW twin-cam 1.3-litre engine, a kerb weight of 835kg and it remained under $20,000 during its nine-year tenure. 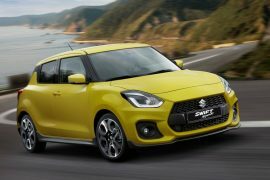 It’s seen as a high point in Suzuki’s hot hatch history that subsequent Ignis and Swift Sport models haven’t quite matched. 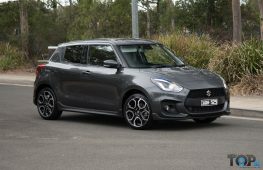 The 2018 Swift Sport is a major leap forward, with 80kg less weight than its predecessor, a turbocharged 1.4-litre engine generating 103kW, bolstered seats and sport suspension. It looks aggressive and fun, but does the drive live up to the promise of its specs and appearance? 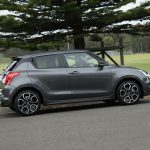 Based on the third-generation of the modern Swifts which debuted in 2017, the Swift Sport features a fairly upright cabin and flat floor for rear seat occupants. It is 3890mm long, 1735mm wide, 1495mm high and sits on a wheelbase of 2450mm. 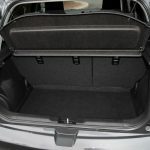 It’s a well-packaged small car with good space efficiency- for a small car- it’s not Honda Jazz in that department but will do most people. The cloth-trimmed sports buckets are very supportive, but the more ample among us might struggling with getting in and out. Nevertheless, they are very necessary as you’ll find out in the handling and steering section. The Swift Sport features a binnacled instrument cluster, with a colour screen display in the middle, including trip computer. What’s lacking is a digital speedometer, meaning glances at the tightly bundled speedometer take longer than they should. In addition, although it is equipped with satellite navigation, the absence of speed camera alerts is a shame on a performance-oriented car. Neither of these factors bode well for keeping your license, so judicious use of the speed limiter is encouraged. 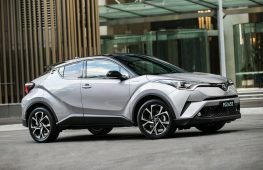 Aside from that, the steering wheel controls are intuitive, as is the easy-to-use climate control system and everything else is where you’d expect it to be. The only other niggle would be the lack of a volume knob on the 7.0-inch touch-screen, but the graphics and standard Apple CarPlay/ Android Auto makes up for this, as does excellent audio quality, with great bass and little-no discernible distortion. 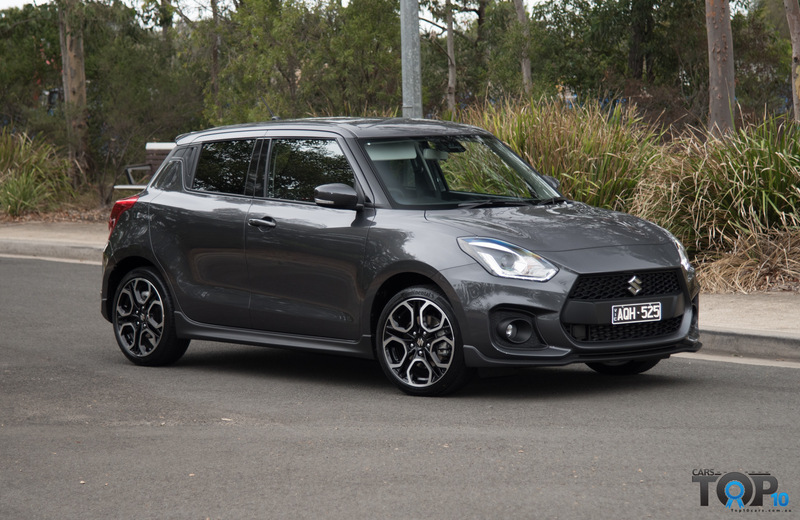 The modern Swift’s big headlight, black A-pillar and cartoonish cute looks have worked a treat since 2005 and the latest iteration builds on that. The bolder lights have a hint of Jaguar F-Type about them. 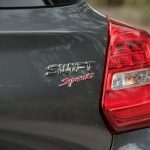 The ‘floating roof’ C-pillar and hidden door handles are not to all tastes, but the Swift Sport gets some specific additions that make it stand out. 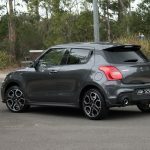 These include CNC-machined 17-inch alloys, twin exhaust pipes side skirts and a hungrier front air dam. Inside, the red accents and stitching on the steering wheel and gear shroud give it a sporty air about it, as does the red tachometer. Nothing really jars here, but as an aside, a plastic panel in the driver’s footwell came loose during testing. Not something you’d expect from this Japan-assembled car, or even the Indian-made Baleno and Ignis. What a little ripper! 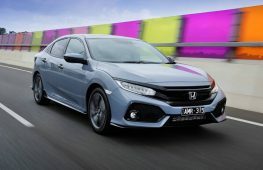 The 1.4-litre ‘Boosterjet’ turbocharged engine is not just a one-dimensional revver like its predecessor that relied on variable-valve timing and high revs. 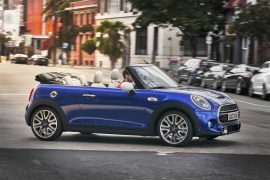 Its 230Nm of torque is available from 2500-3000rpm, making it feel genuinely muscular and effortless in traffic. 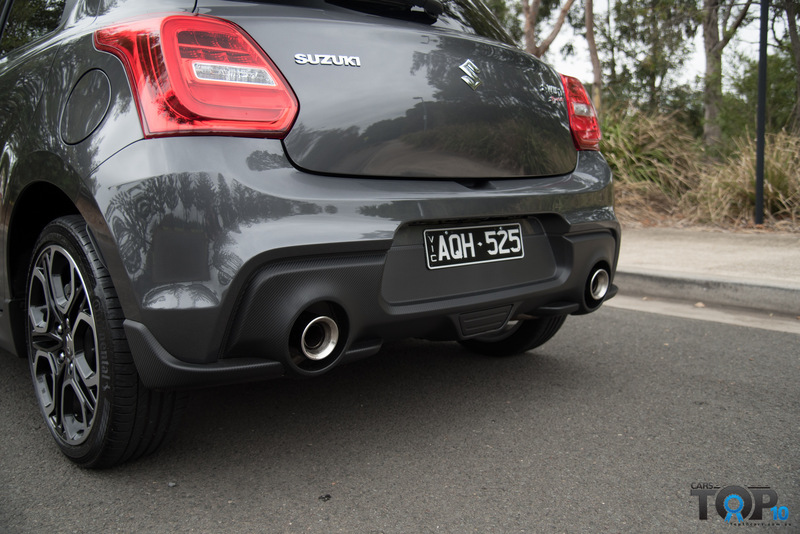 Power delivery is smooth and linear, with the twin exhaust outlet adding a bit of snarl too. Did we hear a few cracks and pops? Can’t be sure, and if we did they were very faint. This is backed up by a 0-100km/h time of around 7.5 seconds . 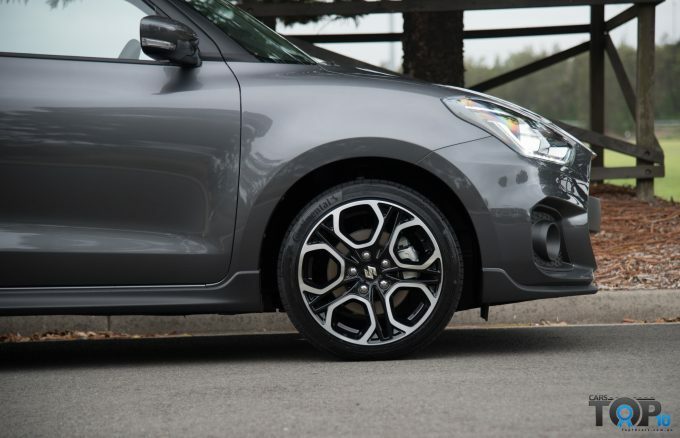 The brakes are progressive and a brilliant ally through the bends, as are the two available six-speed gearboxes. 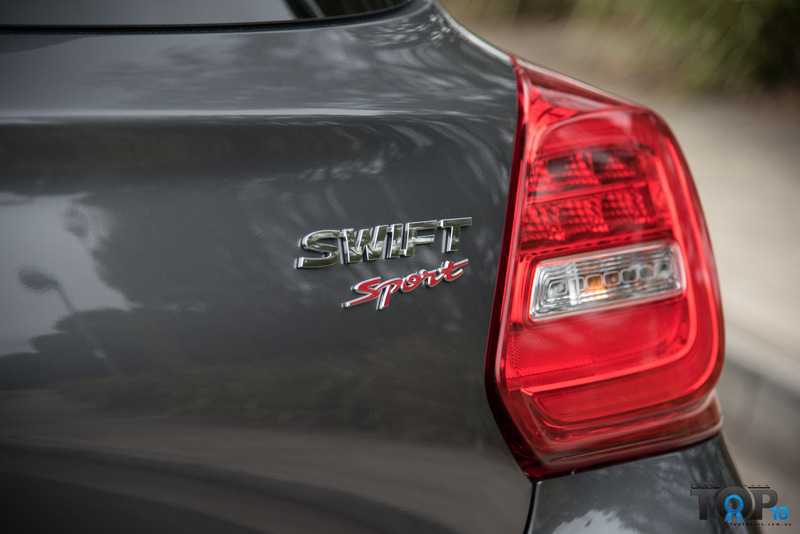 The Swift Sport comes with either a six-speed manual or automatic with paddle shifters. 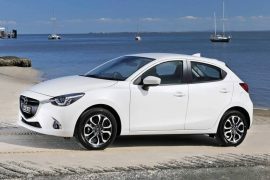 This is a break from its predecessor which also offered a six-speed manual, but automatic customers were ‘treated’ to a CVT with 7 artificial ratios. Starting with the automatic, it’s a clever little unit, with no errant behaviour, regardless of driving mode. 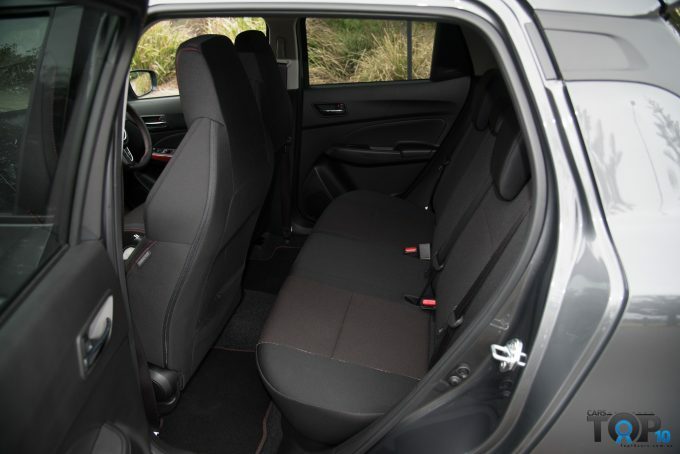 It has a great spread of ratios, that help it in city traffic and also give it large car cruisability on the freeway. If we had a criticism, it’s that perhaps then using the paddle shifters it still upshifts a tad too early. Other than that, you don’t get a sense you’re missing out by choosing the automatic, which is just as well given its $2000 premium. 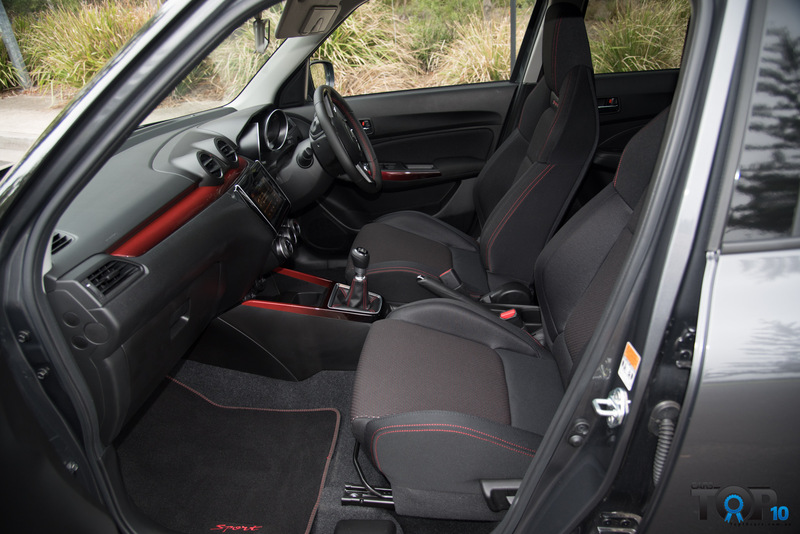 The six-speed manual -arguably what a hot hatch should be- is a gem too. The lever is well-weighted and slots into its gates with a short throw and precision. 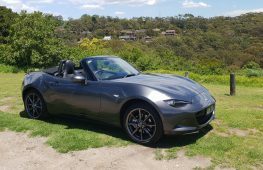 While maybe a bit more rubbery and not as positive as industry best from Porsche or Mazda, it’s still great and combines with a light and well-sprung clutch pedal to make driving easy. We found this to be more fun, just for having more control over ratios during hard cornering. 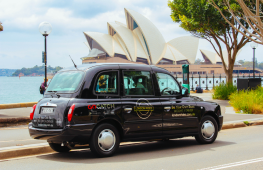 Having said that, Sydney’s worst stop-start traffic had us yearning for the automatic, so either choice is sound. 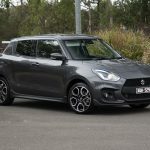 We’d like to see this close-ratio six-speed manual unit proliferate to other Swift variants, to replace the sub-par five-speed in the GL and give GLX Turbo customers a manual option. 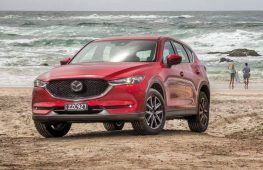 If Mazda can do it with the 2, there’s no excuse. With a kerb weight of 970kg, firm suspension and direct steering, the Swift Sport has the ingredients to be an absolute hoot, and it does not disappoint at all. 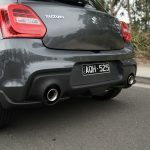 You can throw it into obscenely tight bends and the little bugger just hunts the apex, with eager turn-in and oodles of grip. While there is the odd chirp from the inside wheel, it’s only momentary before the power is effectively put to the road and the next apex is coming up. 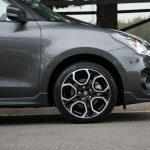 Being such a light and front-heavy car, it can feel a bit unnerving at some of the higher speeds, but it never feels out of its depth and the brakes instill plenty of confidence, washing speed off with aplomb. While we didn’t have the opportunity to take it on a circuit, we think it could stand the punishment well, with even a bit of lift-off oversteer if really pushed to within an inch of its life. Steering through the flat-bottomed tiller is well weighted but being an electric unit doesn’t have the immediate feel of some hot hatch classics like the Ford Fiesta XR4. 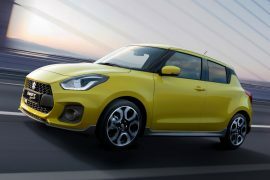 Nevertheless, it telegraphs enough information to your wrists -if not fingertips- to keep the Swift Sport on the boil through chicanes at ridiculous speeds. Massive grin-factor overall. 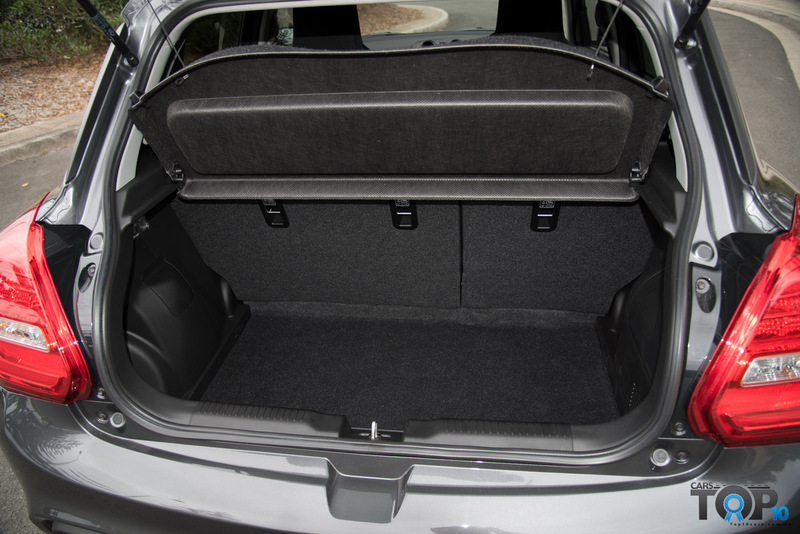 While initially when you get in and hit a sharp bump you might be unpleasantly surprised by how it upsets the car, you quickly get used to the fact this is a stiffly-sprung 970kg hatch with torsion beam rear suspension. As speed rises, the rebound compression improves and it becomes tolerable. Suzuki’s strong ‘HEARTECT’ body does wonders here. There might be some faint wind noise, but tyre roar is well containted. Good effort overall for a car of this calibre. 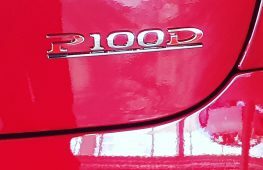 Average fuel economy of 6.1L/100km is quoted for both the manual and automatic. In mixed conditions, we recorded 8.1L/100km for the auto and 8.5 for the manual, but the manual was spanked a bit harder, truth be known . The low-down torque means these numbers will come down closer to the offical rating if driven sedately. Capped price servicing at 10,000km intervals of $199 for the first few is definitely on the cheaper side of things. The Swift Sport has a 5 star ANCAP crash rating thanks to its rigid HEARTECT shell, 6 airbags, autonomous emergency brakin, lane departure warning, weaving alert, high beam assist and adaptive cruise control. It also has forward collision alert, which we found ourselves turning off due to its overzealous nature. Other crash avoidance features include reverse camera. 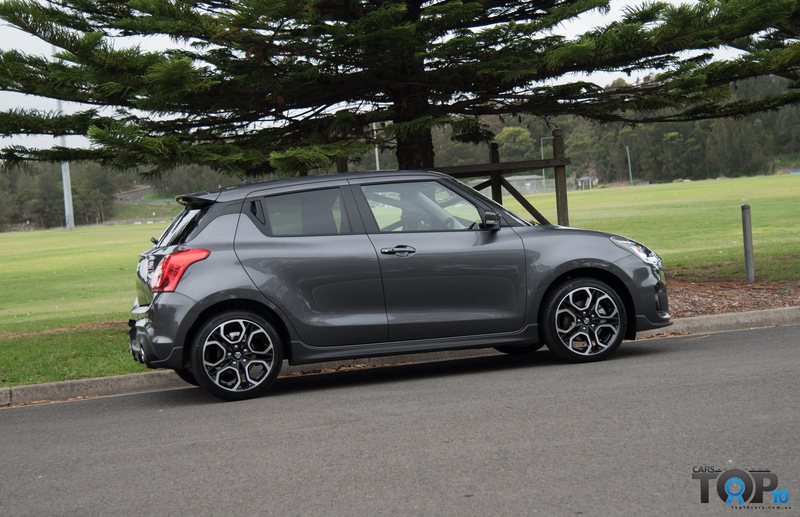 The Swift Sport is $25,490 in manual guise or $27,490 in automatic. 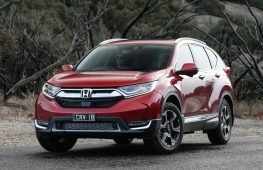 When on-road costs are factored in, this ends up a nip under $30K for the manual and over $31,000 for the automatic, which is getting a bit steep for a B-segment car. 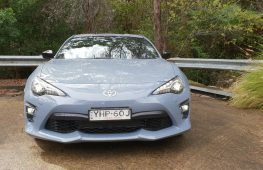 A very, very fun B-segment car but it is starting to approach Toyota 86 territory. This is countered by a generous equipment and safety list but the build quality does betray its shopping cart origins a bit. Still reasonably good buying, but would be more so if those prices were driveaway, in our opinion. 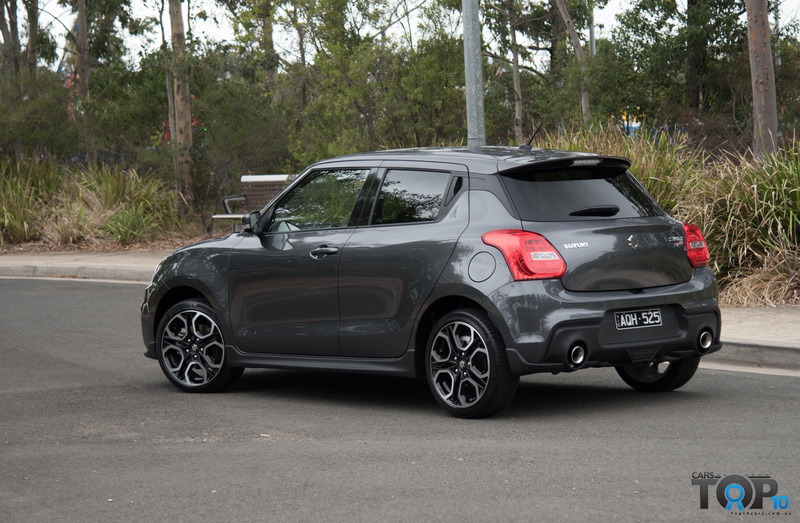 The Suzuki Swift Sport lives up to the hype and is a tremendously fun go-kart, for not too much outlay. 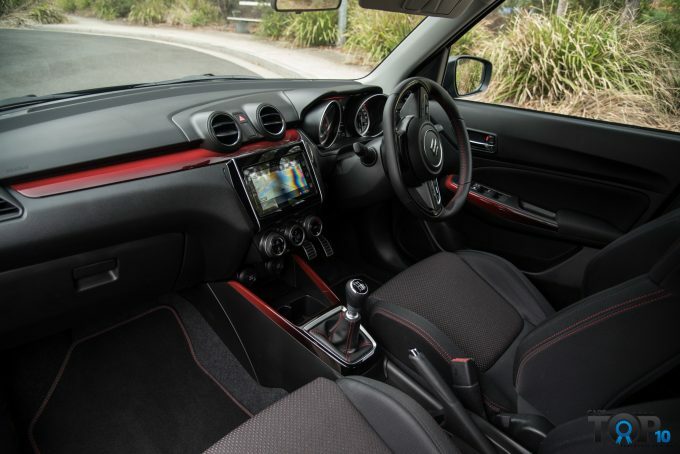 It is a step forward from its predecessors and we would even go as far to say it deserves the GTi moniker. 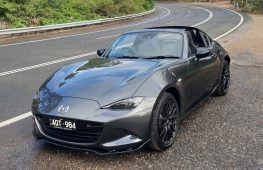 Maybe a stripped-out version with more turbo boost and a limited slip diff would be cool, but as it is, it can inject big helpings of fun into your life without much in the way of compromises.